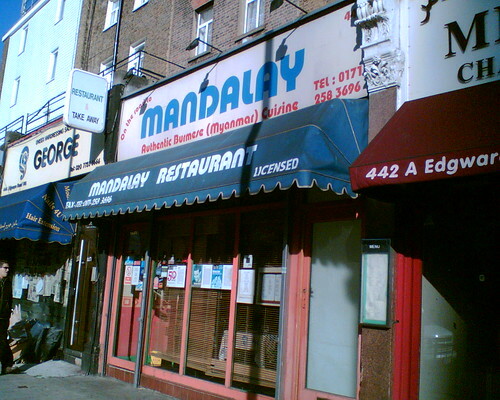 I'd been meaning to go Mandalay on Edgware Road for a looooong time, seeing as it's pretty much the only Burmese restaurant in the whole of the UK. However, I was always a teensy bit put off by the fact that the owners and chef aren't actually Burmese (they are Indian) because I was worried about authenticity. I'm not discriminating - I'm equally dubious about Japanese restaurants run by Russians or Thai places run by Chinese folk. Their website compounded my fears by its lack of one vital ingredient - pork. Burmese people love pork so much there's even a saying about how it's the daddy of all meats (or words to that effect). But hubby and I trundled along dutifully one lunchtime to test it out. Firstly, the decor. Shabby chic is the best I could think of. There's various Burmese artifacts adorning the walls and several magazine reviews too (many from Norway, which is where the restaurant hails from originally, so I have no idea what they actually said) but it's all very homely and cosy, a bit like visiting your aunty's house. Or at least my aunty's house. Our waitress, who was very welcoming, brought us the lunch menu and after one look I immediately asked for the proper menu. I think this is where people have had bad experiences - the lunch menu is awful - packed with dishes from the oriental version of Generica. Upon my request, our waitress sez to me "Are you Burmese?" whereupon I sez yes. So she trots off and gets me the proper menu. I proceeded to order in English but using the Burmese names (which they had written on the menu phonetically in English so anyone can have a go). However, the waitress stopped me in my tracks and admitted she didn't understand. Seems a bit bizarre to have the Burmese names on the menu then. 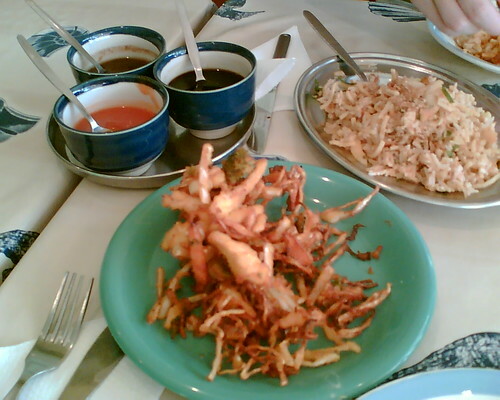 Anyway, we ordered jet-tha a-ywek sohn jaw (chicken and vegetable fritters), htamin let-thohk (rice, potato and noodle salad), thinbawthee thohk (green papaya salad) and jet-tha ohn-no khao swè (chicken and coconut noodle soup). These spellings are my own - the restaurant's versions are at the end. The fritters were smashing - fresh, crispy, tasty and piping hot with various dipping sauces. 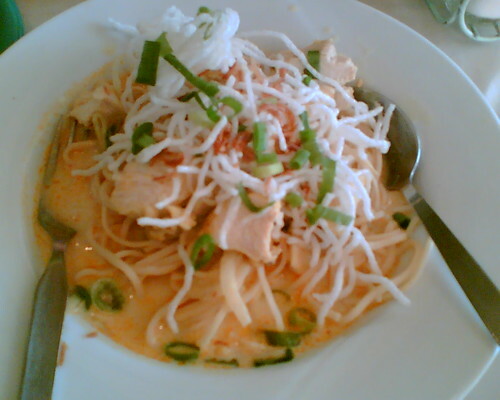 The green papaya salad was also a delight, crunchy, cool and spicy. Hubby's rice, potato and noodle salad was disappointingly bland though, and couldn't even be saved by the accompanying traditional tamarind sauce, or the un-traditional soy sauce (fish sauce is what should have been provided). However, my ohn-no khao swè was absolutely delicious and totally spot-on - rich, creamy and coconutty with plenty of tender morsels of chicken, and they got full marks for the freshly fried crispy noodle garnish on top. Points deducted though for the lack of lime to squeeze and chilli flakes to flick on top. We were in a hurry by then, so we ordered faluda to take away (an Indian rather than Burmese dessert of rose ice cream and various toppings). It was good though and made a very lovely end to a mostly lovely meal. Throughout our munchings, I observed the other tables and they all ordered what looked and smelled like all-in-one plates of homogenous gloop from the lunch menu. They in turn peered at the dishes at our table, wondering probably what on earth we'd ordered. The fritters are great, I agree, especially the Special Assorted option: there've been times when we've been there and eaten more of that than anything else. Strangely I haven't tried the Khau Swe yet, although it's something my Grandma used to make (she was Burmese) - even though I live a few minutes away I don't visit Mandalay as much as I'd like. 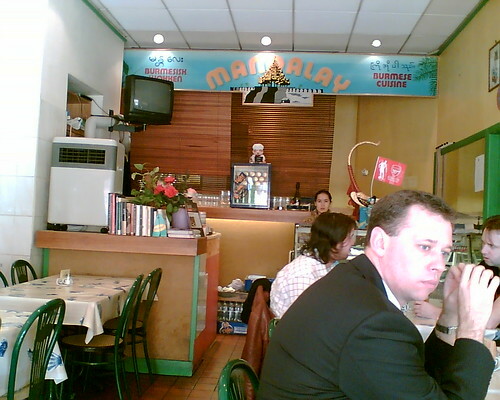 I like the decor though, I find it unpretentious and refreshing: with its rubber tablecloths and so on Mandalay has an ambience somewhere between cafe and restaurant, and it's a good place for a relaxed meal. As you say it's not as if there's any competition in London (or as far as I know the rest of the UK) in terms of Burmese food and it's a unique little oasis on the Edgware Road as well, which is crammed with Middle-Eastern restaurants and shisha joints. @Alex - Mandalay definitely does a good job of keeping Burmese food represented in this country, though it's a bit of a trek. I first tried this restaurant when it was listed as one of the few restaurants in London who cook with "love". Have been a few times now for dinner and the food have always been good. One of the family used to serve as well and they were all very friendly. It seems they started this to fund the families education and I think they are all grown now so this might not be around for very much longer.